...............Brandi H posing in cowgirl attire and in one drawing shown, with a guitar. Liked both of these drawings from tonight's class. 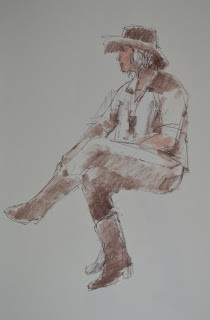 The one without color shows corrections that often occur in quick life drawings. I often just leave the errors in place...besides, conte does not erase well. Note corrections in her right shoulder placement and the more obvious one, her right foot. These were both around 15 minutes, conte and pastel. On 18x24 paper.